Time zones, the International Date Line and jet lag all contribute to my feeling disoriented when traveling. Date lines especially – leaving home on a Tuesday and arriving on the Monday before I left definitely throws me for a loop. But what about when the traveler leaves home in 2011 and arrives in 2004? It happens all the time – when traveling to Ethiopia. Once you disembark in Addis Ababa, you will be at least 7 years younger. My first trip to this time-estranged nation was in September, 1999. The airport was festively decked out with banners proclaiming some kind of celebration, followed by “1993!” I couldn’t speak or read Amharic, so the actual celebration was a mystery – but I figured it must have been a heck of an important party, if Ethiopians left the banners up for 7 years. One never knows, indeed. Even for the most experienced world traveler who finds he is rarely surprised anymore, a visit to Ethiopia will definitely leave him shaking his head. Actually, the banners were only one week old. September 11 is New Years Day in Ethiopia. And on September 11, 1999 (a few days before I arrived) Ethiopia moved from 1992 to 1993. I know that time seems to run more slowly in tropical countries – but 7 years? Ethiopia has its own ancient calendar system which is most closely related to the Coptic Egyptian. It certainly doesn’t resemble ours. In the Ethiopian calendar, there are 13 months. Most people believe that the extra month is the reason for the time delay; however, 12 of the months are 30 days each, and the last month is either 5 or 6 days, depending upon whether it is a leap year or not. Those still add up to 365 days in a year – so why the lag in time? It all comes down a difference in calculation of when and where the Annunciation of the Lord occurred; as with many things in the Bible, it is open for interpretation. The rest of the world decided upon one date but Ethiopia decided upon another. So for the 2,000 years or so that folks have been keeping track, Ethiopia has been losing a few days each year. Over the millennia, those few days annually have added up to 7-8 years difference, depending upon what time of year it is when you are calculating. So, speaking of millennia, when the rest of the world fretted, feared and celebrated the 2000 millennium, I was still in Ethiopia. Needless to say it was a non-event. The Sheraton and Hilton hotels threw a party for the expatriates and shot off a few fireworks, but for Ethiopians it was just another day. 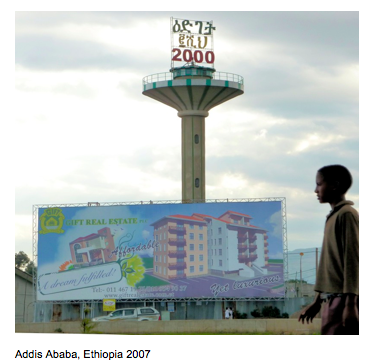 I was back in Canada when Ethiopia celebrated their version of the millennium on September 11, 2007 and unfortunately for me, back in Canada it was – you got it – just another day. Imagine. Two parties of the century and I managed to miss them both. Although I came to understand the details behind the time difference in years, I definitely had more trouble with the clock system. Stand forewarned if you head off to Ethiopia –not only is the country in a different year, they tell time differently as well. Ethiopians use a 12-hour clock, like many other countries. But with a variation that I have never come across anywhere else. “Orop time or Habbishat time?” That is the expression you should memorize, because you will use it several times a day. “Orop” or “Europe time” is how the Ethiopians refer to the clock system the rest of the world uses. “Habbishat” is the casual term for Ethiopians. Here is how it works. When you are in Ethiopia, at 6:00 in the morning (by your watch), an Ethiopian clock will say 12:00. At breakfast, while you are eating the traditional spicy firfir, your 8:00 will be Ethiopian 2:00, and so on. And at 6:00 suppertime , while you are trying to navigate your way through the communal plate of injera and wot, an Ethiopian clock will revert to 12:00 again. Got that? It makes perfect sense. Really. As Ethiopia is very close to the equator, there is little yearly variance in sunrise and sunset… It rises about 6 a.m. (by our standards) and it sets about 6 p.m. The difference is that Ethiopians start their ‘days’ and thereby their clock system at sunrise, not at midnight like us. So at sunrise, their clock reads 12:00. I told you it made sense. Maybe it is the rest of the world that is wacky. Why DO we start our day in the middle of the night? Here is an isolated, rarely visited, third world country that has come up with a more sensible plan. There is something appealing about that. Maureen Magee has never been one to follow the straight and narrow path. You may find her decorating a million-dollar home in Mexico, or sledding across ice floes near Pond Inlet; managing an Ethiopian touring company or managing a Canadian theatre school. There is no itinerary for her journeys, and by the time you get the postcard, she will be somewhere else.